This year’s Sangyaw Festival also known as ‘Festival of Lights’ will “be a sight to see” according to Tacloban City administrator, Atty. Tecson John S. Lim. While he did not divulge the unique features of the festival, he said preparations are underway for the month-long celebration that will kick off this weekend simultaneous with the Grand Santacruzan, an event that is also organized by the city government here. He disclosed that last year’s festival was record-breaking with the festival gathering some 1.2 million spectators surrounding the streets of Tacloban just to watch the parade of floats adorned with lights. “Sangyaw,” which is a local dialect here, means to announce or herald news. It started during the time of former First Lady Imelda R. Marcos showcasing the history of Tacloban City and Leyte province, Lim said. Unlike other festivals that are being held in daytime, Sangyaw is held during nighttime with lighted floats filled with decorations depicting the culture of Taclobanons. “It tries to show that sometimes when darkness enfolds us all there is a light that shines. It is an educational festival, always carries with it a historical value,” he said. Its highlight is slated June 29 where floats that will be mounted by various participating barangays in the city will parade at the city’s thoroughfare. “Barangays were given freedom on how to express their culture but it still evolves on the culture and history of Tacloban,” according to Malou Tabao, the officer-in-charge of the city’s tourism office. This year’s holding of the festival is also significant as it serves as a platform to unite local government units (LGUs) - city of Tacloban and province of Leyte. The latter has also its own Pintados-Kasadyaan Festival which is also slated this June 29. Lim said that both LGUs extended hands to achieve unity and peace in the celebration that honors Señor Santo Niño. He said that the “Day of Festivals” would be the first in the country. 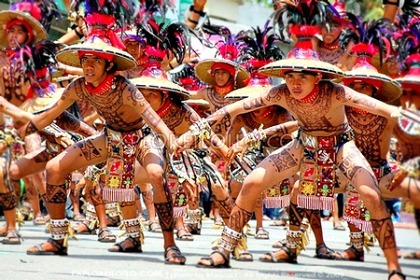 The Pintados-Kasadyaan Festival of Leyte would showcase various festivals of the province as well as other participating contingents in the region in the morning while it will be a parade of floats in the evening. With the coming ‘Day of Festivals’ we are expecting that this will already draw lots of tourists. Maybe not this year, because people are on a wait and see but we are optimistic that it will be very successful,” Lim stressed. Along with that he also looked forward that while the events boost the tourism industry of the city it will also bring more economic returns for the city and province of Leyte. Engr. Kenneth Uy, who handles side events of the Sangyaw Festival said that he will appeal to business establishments to open 24 hours in June 29 so that there will be economic activity in the city.